Died: June 9, 1894 in Bourne Ma. at 78 yrs, 5 mos. Married: September 30, 1834 in Sandwich Ma. 1. Rosilla/Rose C. Wright Phinney; (June 11, 1837 – November 18, 1906); Married John Adams Phinney (1833 – 1908) (John Phinney & Betsey (–)) in Sandwich Ma. on May 24, 1858; Rosilla/Rose is buried in South Monument Cemetery in Monument Beach Ma..
2. Elizabeth Loretta Wright Weeks Weeks; (March 22, 1839 – 1900); Married (1) Heman S. Weeks (1836 – 1884) (Marcus Tullus Cicero Weeks & Roxanna (Weeks)) in Sandwich Ma. on January 25, 1863 & married (2) Heman’s brother Uzzial Weeks (1826 – 1909) (Marcus Tullus Cicero Weeks & Roxanna (Weeks)) in Bourne Ma. on October 28, 1891; Uzzial married (1) Sarah S. Folger (1830 – ?) (Mark Folger & Nancy Swain) in Nantucket Ma. on August 30, 1849 & married (3) Judith G. Folger Burdick (1836 – ?) (Mark Folger & Nancy Swain) in West Springfield Ma. on June 7, 1902; Judith married (1) Henry C. Burdick (1832 – ?) (Christopher Burdick & Lydia Easton) in Nantucket Ma. on November 19, 1856; Elizabeth probably died in Iowa; She & Heman are buried together in Pocasset Cemetery. 3. Anderson Wright, Civil War; (December 26, 1841 – October 21, 1900); Married (1) Sarah Elizabeth Newcomb (1844 – 1869) (David Newcomb & Emeline M. Phinney) in Brewster Ma. on May 8, 1864 & married (2) Melissa Jane Wilkinson Chellis (Abt.1848 – 1903) (Charles G. Wilkinson & Lucy L. Leighton) in Chelsea Ma. on December 29, 1886; Melissa married (1) Charles Henry Chellis (Abt.1844 – 1883) (Timothy H. Chellis & Delia C. Drake); Anderson is buried in Pocasset Cemetery. 4. 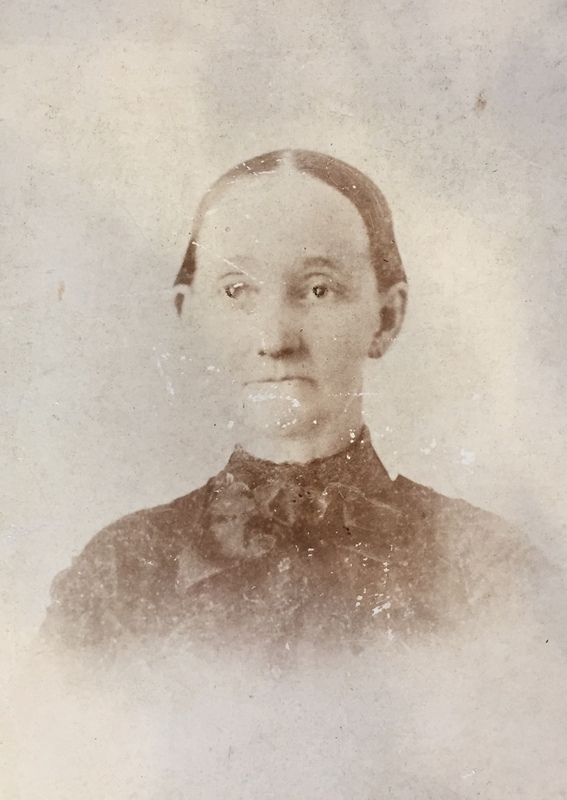 Martha S. Wright Perry; (February 20, 1843 – January 1, 1890); Married Henry Perry, Civil War (1840 – 1905) (David Perry & Frances/Fanny D. Gibbs) in Sandwich Ma. 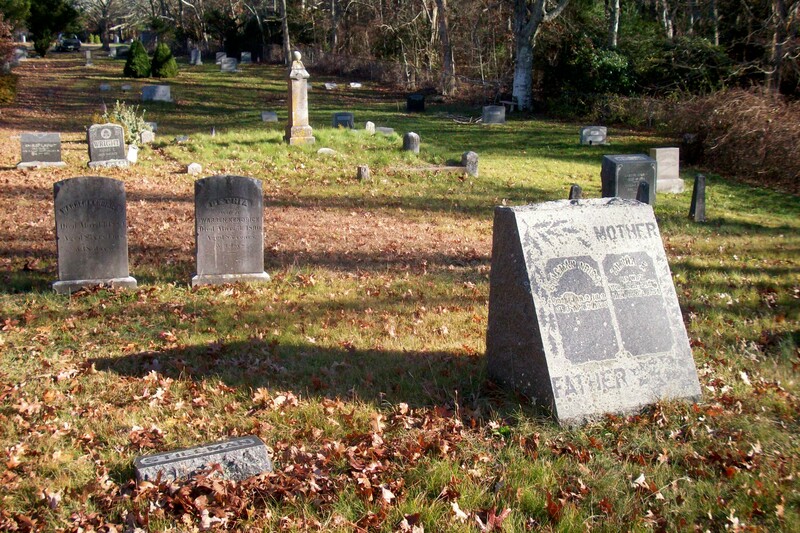 on May 12, 1867; Henry married (2) Elizabeth V. Phinney (1841 – 1922) (Heman Phinney & Abigail Bourne) on February 23, 1892; Martha, Henry & Elizabeth are buried in South Monument Cemetery in Monument Beach Ma..
5. 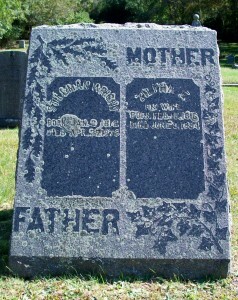 Noah H. Wright; (February 22, 1845 – April 2, 1907); Married (1) Sarah Small (1846 – 1897) (David Small & ?) in 1864; They had 4 children; Noah married (2) Bernice M. Hall (1873 – 1899) (John H. Hall & Mary P. Nye) in Falmouth Ma. on June 1, 1899 & married (3) Willhelmina C. Peterson (Abt.1870 – ?) (Lars Peterson & Anna Svenson) in North Falmouth Ma on April 16, 1900; Willhelmina married (2) George Raymond Slater (Perley F. Slater & Alice Deane); Noah, Sarah & 3 of their children are in Pocasset Cemetery; Bernice is buried in North Falmouth Cemetery. 6. Zilpha E. Wright Perry; (January 5, 1847 – ? ); Married Nathan Chapman Perry, Civil War (1843 – 1910) (David Perry & Frances/Fanny D. Gibbs) in Sandwich Ma. 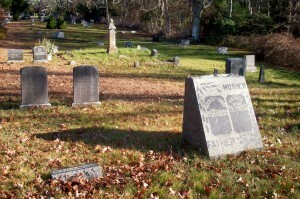 on December 20, 1868; Zilpha & Nathan are buried in Pocasset Cemetery. 7. Stillman Wright; (July 12, 1849 – March 14, 1854); Stillman died at 4 yrs, 9 mos, 14 d..
8. Robert Luther Wright; (May 27, 1852 – March 15, 1928); Married (1) Elizabeth A. Luce (1852 – 1875) (Charles Luce & Cynthia (–)) in Barnstable Ma. on July 3, 1872; Robert married (2) Sarah Elizabeth Swift (1858 – 1918) (Browning A. Swift & Mary Jane Baker) on March 6, 1878 & married (3) Emma Peterson (Abt.1867 – ?) (Lars Peterson & Anna Svenson) in Bourne Ma. on November 16, 1897; Robert was a moulder, mariner & teamster; He is buried in Pocasset Cemetery (headstone not located; E.D. Nickerson records). 9. Stillman Bradford Wright; (May 27, 1855 – March 8, 1937); Married Effie M. Baker (1859 – 1933) (David Howes Baker & Amanda Malvina F. Bassett) in Sandwich Ma. on November 29, 1877; He was a moulder & also worked for President Grover Cleveland; They had 4 children; Stillman B. is buried in Pocasset Cemetery (headstone not located; E.D. Nickerson interral records). 10. William Chester Wright; (December 21, 1858 – May 12, 1923); Married Annie Dalton (1860 – 1956) (James Dalton & Elizabeth MacDonald); William, Annie & their daughter Alice M. Wright Towne are buried together in Pocasset Cemetery. 11. Preston Allan Wright; (November 17, 1861 – January 6, 1928); Married Teresa Morris Daniel (Abt,1881 – ?) (Charles Daniel & Catherine Morris) in Hyannis Ma. on October 15, 1906; He was a boatbuilder; They lived in Osterville Ma..